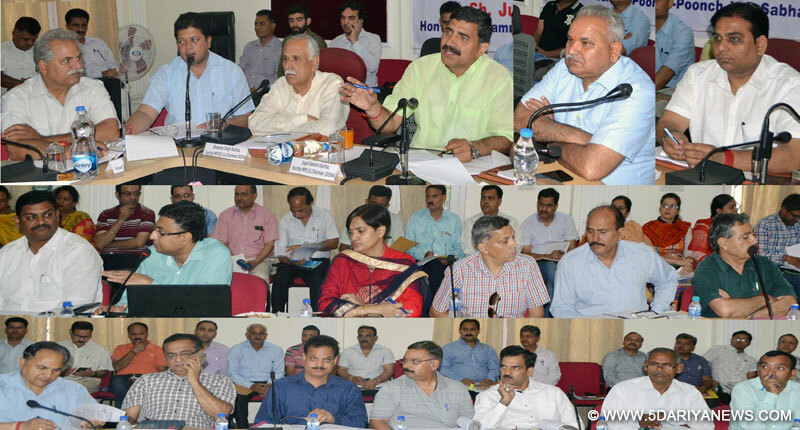 Member Parliament, Jugal Kishore Sharma, today chaired the District Development Coordination and Monitoring Committee (DISHA) meeting for district Jammu to take stock of functioning of the Committee.“Effective monitoring and enhanced coordination are essential ingredients to obtain optimum outcome of welfare and development schemes being launched by the government to improve socio-economic standards of people”, the MP maintained while emphasizing successful and timely completion of several central schemes launched in this regard. Minister for PHE, Irrigation and Flood Control, Sham Choudhary, Member Parliament, Shamsher Singh Manhas, Members Legislative Assembly, Rajesh Gupta, Dr. Krishan Lal, Dr. Gagan Bhagat, nominated members Sunil Sharma and Mansa Ram were present in the meeting.Jugal, while taking a comprehensive review of the physical and financial achievements registered under various centrally sponsored schemes, stressed that the need is to put in synergized efforts to achieve tangible results. He stressed on completing the projects in a time bound manner with optimal utilization of funds. He directed the concerned departments to envisage projects based on area specific developmental needs besides asking for taking the concerned representatives on board for effective implementation of the welfare schemes.Speaking on the occasion, Shamsher Singh Manhas stressed on creating mass awareness among the people with special focus on rural areas so that target populace can avail the benefit of various schemes. He asked the officers to reach out to the people so that they are kept well abreast with the welfare programmes so that these are implemented in letter and spirit. Meanwhile, the PHE Minister also suggested several innovative measures to further streamline the working of the Committee. Legislators also highlighted the issues pertaining to augmentation of power and water supply, awareness about welfare programmes, renovation and repair of water reservoir, ration supply etc.Earlier, District Development Commissioner, Rajeev Ranjan gave a detailed presentation on the physical and financial achievements registered under various centrally sponsored schemes. He informed that under MGNREGA against the approved budget of Rs.70.34 crore an expenditure of Rs.61.46 crore was incurred during the last fiscal with completion of 8054 works in the financial year 2017-18 an expenditure of Rs.20.50 crores have been made against availability of Rs.58 crores with 2016 works in hand. It was also given out that about 75036 job cards were issued and 15.98 mandays were generated . DDC also gave a detailed account of achievements recorded under Pradhan Mantri Gramin Awas Yojana, Deen Dayal Antodaya Yojana (NRLM) under which 21272 households of four blocks have been covered.The meeting was also apprised of the progress achieved under Deen Dayal Upadhayay- Grameen Koushalya Yojna (DDU-GKY), Shyama Prasad Mukherjee Rurban Mission, National Rurban Mission (NRUM), PMGSY, Swachh Bharat Mission, NRDWP and Sarva Shiksha Abhiyan and ICDS.Commissioner, JMC, M Raju, ADDC Anuradha Gupta and other senior officers were also present in the meeting.